Hey Everyone! I celebration of Love Lines first birthday i have another treat for you all! 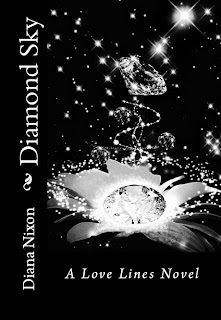 The book trailer for Diana's new book Diamond Sky (Love Lines #3) Come and check it out! Diana Nixon A new page of the Love Lines story that will reveal new secrets and mysteries buried in the walls of Dever. Eileen, Christian and Evan need to find an old spell to protect themselves and those they love from being killed. There is only one problem – no one knows where the spell is hidden…. A mysterious student comes to Dever. A boy whose eyes are always watching. Who is he? What secrets are hidden behind his smiles? Is he a friend or an enemy?... When they thought they knew everything about the super powers they possessed, they could have never imagined that in reality they didn’t know a thing. The wind can turn into the worst hurricane they have ever seen. The water can destroy everything. The earth can swallow them alive. And the fire can burn them to ashes…. The illusions - the only thing they tried to run away from, will come back to ruin the world they live in, taking away everything they ever cherished and loved. When you think you are so close to getting what you want, think twice about your every step. Because what you think is the right thing to do may take away your life….